Available in white or sleek graphite steel, this LG front load washing machine earned top ratings for its energy efficiency. With effective hot steam cleaning, bacteria are eliminated and clothes are left smelling fresh and clean. Even cold washes clean well, thanks to the unique combination of washing motions that ensures every clothing article is reached. The extra-large stainless steel tub holds larger loads, meaning you’ll have fewer loads to run overall. 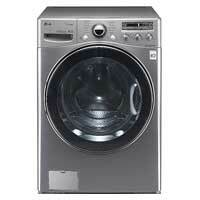 For $1,197, this LG model has an attractive modern design and superb cleaning performance.